Jim Lantrip has more than 26 years of experience in the Security industry in all aspects of the business, from operations, sales, engineering, product development to project management. He is currently the Segment Head for Security with Siemens Building Technologies and has been with Siemens for three years. Past positions include11 years with Tyco Integrated Security as most recently, the VP & Director of Integration Strategy, and Card Key Systems and ADT Security Services, Inc. He holds a Bachelor of Science in Electrical Engineering from the University of Mississippi. SecuritySolutionsWatch.com: Thank you for joining us again today, Jim. Previously, we discussed the solutions, Siemens delivered to Port Manatee in Florida. Today, we'd like to drill down a bit further into Siemens’ comprehensive portfolio of products and solutions and also discuss additional use cases, where Siemens has delivered solutions to help solve specific business challenges. Let's start with access control. We understand that SiPass Integrated is a powerful, flexible access control system that provides a very high level of security without compromising convenience and ease of use for system users. Please walk us through the major benefits. Jim Lantrip: First, I'd like to say, our approach on products is that they are a part of a solution to support and enhance our customers and their business. SiPass integrated is a critical piece of this solution and has been delivered around the world for single sites or multiple locations. We use it as a service base to provide managed access control and hosted access control for specific customers and the product itself is rock solid. In the US, our largest system has over 6,000 readers with tens of thousands of users in the card holder base. SiPass has a typical architecture with a head end control panels and readers. However, we have some unique set up capability, in addition to single door and multiple door controllers, and reader interface modules that can take in multiple input points. We can configure the system as an intrusion system, doing inputs and outputs based on actions from the card readers. Advanced Services Programming or ASP also is a differentiator allowing drag-and-drop utility much like Visio, where you pick the action you want to have and the results you want to have from that action. This visually creates the programming and sequence. For example, let’s look at a man trap or sally port with two card readers. When the first reader is read by an individual with approval, this door unlocks, but the other door has to remain locked. This is easily programmed via ASP by dragging and dropping pictures that represent your devices and the action you want t take place. You can include input points, output points, card readers and even software commands as a part of that Advanced Services Programming. It's very flexible and unique so our customers can create these easily to meet their business needs. SecuritySolutionsWatch.com: Today’s constant threat environment has never been more challenging. Siveillance Video Management Solutions is for small to large scale and high security deployments? What are the efficiency and ROI benefits on this solution? Jim Lantrip: Siveillance Video Management System or VMS is a robust management station that typically works within an IP together with analog cameras. There are built-in analytics which is included at no cost to our customers. This allows you to do tripwire directional motion and two-zone so you can get a pre-alarm and alarm. In addition, there is an upgraded version that allows you to do multiple zones within single cameras that come as part of the base package for greater flexibility. Our customers can start using in SiteIQ analytics immediately and if they need more power in the analytics they can upgrade with a simple software key. The system is flexible with three levels: 100, 200 and 300, with each level adding capabilities. Going from 100 to 200 provides the ability to have multiple systems connected to a single head-end. For example, you might have a location remotely managed by their team, but you need to look in and you have full connectivity through interconnect. This setup is used for locations that have low bandwidth too. The 300 package provides the ability to have a federated system where you have a single head-end that manages directly multiple systems with the head-end having complete control over what users can do on the other end and what they can't do, what they can see, and what they can't see. For Siveillance VMS, we have the ability to bring in both analog and IP cameras, as well as to work with third-party analytics out of the box. SecuritySolutionsWatch.com: Let's turn to Desigo Mass Notification. When shots are fired, split-seconds matter and everyone is getting their information in panic mode. They need to know where to go and what to do. Please give us an overview of Desigo Mass Notification. Jim Lantrip: As you know, when events occur whether it's an active shooter or an earthquake or even simple things like a train breaking down, the need for information that is clear and concise is critically important. Desigo Mass Notification or Desigo MNS is a platform that provides messaging in multiple ways to effectively reach everyone who may be affected by the emergency. It's very simple from an operator perceptive, you an easy button based on a scenario. From there, the operator can send automated messages, input a message that goes out, or customize the next steps depending on the scenario. The messaging then goes out via multiple modes. This could be put in a Twitter feed up, a Facebook post and digital signage. For example, if there is a sign that is normally used for advertising, the system can take it over and post messages that there has been a derailment with potential hazards materials, please leave the station in this direction and show a map of where people should go. There also can be audio messaging through IP or standard audio speakers or the fire alarm system. And, we've got computer messaging, which goes straight to people's desktop computers as well as text messaging directly to phones. What differentiates our solution is that we also have a two-way response mechanism where a person can indicate “I received the message and our group is leaving and going to our muster area or safe space.” Desigo MNS is very flexible and powerful system for both active situations and alerts. It also integrates completely with our building automation system—Desigo CC--and we can bring in video piece into the Desigo MNS platform to show the correlation of what's happening and what messages you're sending out. SecuritySolutionsWatch.com: Let's turn to Siveillance Vantage. We understand that the command and control solution from Siemens is specifically designed to support security management at critical infrastructure sites, industrial complexes, campus type environments or multi-site applications. It provides precisely the kind of real-time support needed to react effectively to security and safety incidents at any time. Jim Lantrip: Siveillance Vantage is our flagship command and control product, which is a great extension of a PSIM. However, Vantage takes it a step further since it was designed to meet the needs of critical infrastructure. Vantage takes the inputs or integrations from just about any system type and make it usable information that is actionable. To do this, we create workflows. Starting with an incident type and create a workflow around that incident, customers can have both automatic and user intervention actions that are required as well as the documentation needed. When did the incident occur? When did the alerts come in? Who handled it? How did they handle it? What steps did they take? Who responded? We have our resource management component to this that we can identify what resources are available in the area, whether it's where the closest weapons locker is for an active shooter scenario for law enforcement, or where the closest person is that knows CPR when someone is having a heart attack. We can manage that workflow and get the right people to the right place efficiently, because the operators know what’s happening. What do I do? 1: Look into base of users that are CPR certified. 2: Find out where they are. 3: Dispatch them. 4: Here are instructions to how you talk to the people on the other end, so that they can begin giving CPR until the professional arrives. The result is that it keeps the situation calm by giving the operators the ability to follow a simple step-by-step approach. They know what resources are and available potentially even integrated with computer dispatch systems to automate phone calls and feedback for them in that respect. After the event, when you do a debrief to make sure the next time you handle even more efficiently. Since all of the data resides in one location, you can get a print out that shows every step that was taken, what feedback we got out from what kinds of sensors that supports the data, and what phone conversations take place with time with date stamps as well as correlating video or other integrations into that feedback. This allows you to do a quick, clean, debrief and adjust your processes if necessary. SecuritySolutionsWatch.com: Can we please get your perspective on what differentiates Siemens offerings. And how does this tie-in with Siemens being a strong integrator? Jim Lantrip: Siemens has a very customer-centric view. We look at our customers holistically. We're not just looking at them from a security perspective or a life-safety perspective or building automation perspective. We're looking at how we can help them with their business. And while we do break it down by market segment, we look in each segment and where we have our strengths, but more importantly we look across all the market segments and see if there are synergies that we can bring to the table that really helps our customers, manage, maintain and grow their business, as well as the practices that are underneath it. We can deliver many project sizes to help facilitate all types of projects and we have a strong team of developers that we could integrate and/or adjust specific items to be tailored to our customers’ needs. We also have very strong product offerings that are geared towards the total building– along with the service capability to deliver and support those products and solutions. SecuritySolutionsWatch.com: We really enjoyed the discussion last time around regarding the solutions Siemens delivered to Port Manatee in Florida. We’d love to discuss some additional use cases. Jim Lantrip: Goodman Manufacturing in Houston is another example. It is a single location, new construction of a large manufacturing facility which manufactures large HVAC units. Here we used Siemens portfolio of products for access control, video and analytics to help resolve some specific customer challenges. Goodman has an extensive manufacturing facility and warehouse with over 50 roll up overhead doors along one wall for loading and unloading large, industrial-grade chillers and HVAC units. We have worked with this company for a long time to help them understand what they were building in this new facility. They did not have a team that it had ever done a construction before so we brought some expertise to help them plan this new facility and bring efficiencies based on our experience. From a security perspective, we demonstrated how Siemens products were very good fit with Siveillance VMS for video management, SiPass integrated for access control and SiteIQ Analytics to reduce their overall spend. For example, we suggested using analytics to protect the overhead doors instead of installed roll up door contacts—a rather unique application, but in the end it saved significant dollars. We brought all of Siemens's expertise to bear during the early planning stages. They recognized we had expertise and we were able to help them design solutions that could have been any manufacturer on the surface, but were able to show them how our products could be a better fit and provide more synergies to their business. Another example, our advanced services programming adjusts the access control requirements on the fly or using our SiteIQ Analytics to minimize the spend on video platform, also giving them the protection that they wanted. SecuritySolutionsWatch.com:Thank you for joining us again today, Jim! SecuritySolutionsWatch.com: Thank you for joining us today, Jim. Before discussing Siemens Solutions in greater detail, please give us an overview of your background? Jim Lantrip: I've been in the security industry since the late '80s and have more than 26 years in the industry. During that time, I have worked for a few of the larger companies in the industry. My experience in the industry is varied from sales to project management, to system design and building teams. This involved building unique teams inside of companies that were created to go after the more complex opportunities whether it's integration opportunities or larger projects and do this successfully. We built sales engineering and design teams to selling large complex opportunities as well as adjusted the delivery teams through new roles, enhanced skills and processes to be able to deliver these projects successfully. I've been with Siemens for almost three years as the Segment Head for Security and I believe this was a great move for me. Siemens security performs the type of work that I enjoy the most--medium and large security projects. We have with the ability to deliver the most complex projects in the world including integration projects, Siemens is uniquely positioned to do very high-level integration work whether it’s integrating separate security products into a Command and Control platform, integrating products from adjacent spaces like automation, fire or integrating with our customer's business systems. We sell and deliver these projects regularly and that was one of the key drivers for me to move to Siemens. SecuritySolutionsWatch.com: We read with great interest about Siemens’ ongoing work with Port Manatee, which is one of Florida's fastest growing ports. We understand that the solutions provided by Siemens combined two key technologies. Please tell us about the solution Siemens delivered to increase the security and efficiency at Port Manatee. Jim Lantrip: At Port Manatee, the foundation for the solution is Siveillance Vantage Command and Control Platform. Vantage is a very robust platform and made to integrate multiple systems, to allow complete situational awareness including workflows, resource management, and audit trials. The Vantage Command and Control system takes the sub-systems and uses the information from each to make it easier to handle difficult situations consistently through workflows and resource management. Integrated into our Vantage Command and Control platform is our SiPass access control platform, video management system and mesh network. It's a very capable system with a great track record that helps the port manage their landside traffic more efficiently, stay compliant with the federal regulations, and provide work flows that can help them manage the port business. This includes a key aspect of managing visitors that both do and don’t carry a TWIC card. These integrated technologies provide the Port with complete situational awareness that helps them remain compliant with all the regulations that are critical to their security and operation. It also helped them turn the security department into a profit center. SecuritySolutionsWatch.com: Thank you, Jim. We also read with great interest the testimonial from Mr. David St. Pierre who is the Director of Seaport Security at Port Manatee “From the time they come in and tell us what they're doing, we can track them.” This is indeed quite impressive, Jim. Care to elaborate? Jim Lantrip: Certainly, so they have two primary types of visitors who come to the port, they’re mostly delivery drivers that are picking up or dropping off containers. Of these visitors, there are two specific categories -- those that have a TWIC card which means they've gone through the background check and carry a Transportation Worker's Identification Card and there are those that do not have TWIC card. The compliance ledgers require the Port to know and document who does/does not have a TWIC card. Additionally, those drivers who do not have a TWIC card have to be escorted the entire time that they are on the Port in controlled areas. With our system, the Port was able to track and manage all drivers entering and leaving the port and they can link the cab, driver and container they entered or left with. The system creates an audit trail through the subsystems and provides positive video backup. This also created operational efficiencies for the Port and also allowed them to charge for services such as escorting non-TWIC holder drivers. This is how what was once a cost center for the Port was able to become a profit center. SecuritySolutionsWatch.com: Thank you, Jim. Can we discuss the IoT and BYOD environment for a moment? Cyber security is, of course, front page news just about every day. What are your thoughts Jim, regarding best practices in this environment? Jim Lantrip: Cyber security has become an important piece of most physical security practices. It’s an ever-evolving space because Internet of Things and the Bring Your Own Device space certainly can create challenges securing networks effectively--plus it requires expert ise that has not been found in the physical security department until the last few years. To protect your company, systems and information, I would recommend understanding what is connected to your system and your network. Research and ensure that all devices meet the appropriate standards for your company. Next, work in a physical security practice in conjunction with your cyber security practice. They have to go hand-in-hand or one will leaves gaps in protection for the other. Finally, make sure that you understand that the threat environment is ever changing. It's getting increasingly more sophisticated and you have to have the experienced personnel to deal with the changing threats, make recommendations, and recognize those challenges and stay ahead of it. There are experienced integrators that understand this and will work with you. The best practices in this space will continue to evolve. Today, they are relatively straight forward –- have both a cyber security and physical security practice that work together--create the processes for protecting your environment from cyber attacks, identify the holes, and close them, have a quick response program to handle any crisis that could pop up and protect the physical space so nobody has direct access to your network or your key servers. Never get complacent you will need keep it evolving and growing as you go forward. SecuritySolutionsWatch.com: It's fair to say that Siemens’ track recordand brand recognition is second to none. What is your perspective Jim regarding the unique value proposition that Siemens delivers? In other words, why Siemens? Jim Lantrip: Siemens is a uniquely positioned company. 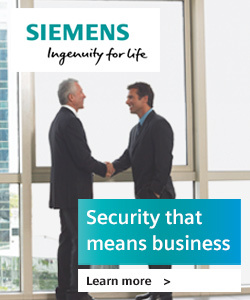 Security is a part of the Siemens Building Technologies Division we are set up to provide automation, fire and security as an integrated system. Our strategy is to bring synergies between these disciplines to provide greater value to our customers. Our ability to merge the three disciplines into a single solution to help our customers while meeting the needs for different departments like a facility management department and a security department set us apart. Siemens has the ability to manage large complex projects and we bring the engineering and project management expertise to the table. So, we can assist our customers in creating integrations and bringing building systems and business systems together better than most companies out there. SecuritySolutionsWatch.com: Thank you Jim . What resources are available for the security community from Siemens? Jim Lantrip: We have a host of resources that are available on our web site: www.usa.siemens.com/means-business, from videos on Los Angeles Airport and Port Manatee to white papers and case studies that are vertical focused. We have some key vertical markets that we focus on including Ports, Municipalities - which are part of the critical infrastructure space – as well as higher education, healthcare, offices and campus’s. Our focus in these verticals is to understand the unique business challengesthat these vertical markets face, how they operate and how we can use our products to create solutions to help. We are positioned to create integrations, with our development/integration teams to most any system on the market, whether it’s our customers’ business systems or other security systems. Through this, we can create unique solutions that tailor our systems to fit our customer’s unique needs. SecuritySolutionsWatch.com: Thanks again for joining us today. Are there any other subjects you would like to discuss here today, Jim? Jim Lantrip: Stay tuned - next time where we will get more in-depth about our solutions and Siemens line of security products as well as some use cases about specific business challenges we have helped solve with our products.